I am writing to you from a place full of sunshine!! It's been glorious here! Finally! I think I'm going to try to do two posts today...we'll see. Alright, so I was tagged 5 times to do the 11 question thingy! I'll start with Kaye's questions. What is your earliest memory? I think I was around 1. I was jumping in my crib crying for my mom. I didn't want to go to sleep. I remember the light on in the hallway. That and spitting on my first birthday cake's candle! If you could travel anywhere in the world where would you like to visit and why? Ireland. My Nana is from Ireland and I have yearned to go there since I was 6 years old. Something is calling me to Ireland. List your top five designers and give at least one reason why each one is your favourite. Hmm...hard to choose but I would have to say Shakespeare's Peddlar for her reproductions, Ink Circles for the colours and swirls, Plum Street Samplers because her designs make me happy, Blackbird Designs because I adore their motifs and the patterns are easy to follow, and Chatelaine because Martina is a genius and uses the most amazing specialty stitches, silks and bling!! If a movie was being made of your life, who would play you and what would the theme song be? I don't think a movie should be made of my life!! It would put you all to sleep!! What is your favourite movie? Why? Another hard one....the LOTR trilogy because it's a tale of good vs evil, love, relationships, loyalty and strength. List five of the most influential historical figures and explain why you picked them for your list. Is this influential to me or to the world??!? Hmmm, Queen Elizabeth I - she never married and ruled alone, Napolean - he made himself an Emperor and nearly conquered Russia, Tsar Nicholas II - the most misrepresented tsar in history; he was kind, loving to both his family and his people and is a saint in our church. There were many falsehoods written about him and his family in many history books and the family is still mentioned in TV shows, movies and books. Wow, this is hard...um...hate to say this but Stalin - brought Russia into the industrial age but nearly destroyed her in doing so and since the Communism revolution in 1917 , over 26 million people were killed and/or misplaced. It was a cultural and religious holocaust. I could add so many more people here....but I'll add Thomas Edison - the American inventor who invented so much!! What do you love doing most in the world? Being with my husband and petting Titus. Cats or dogs or both? Why? Both, although it used to be dogs up until I had a cat. I adore dogs because they adore me, and I adore cats because they like to be adored!!! What is the one thing about your life that you would change if you could? Live in a better apartment with a patio so I can grow things!!!! Why do you blog? To share my passion for stitching and life with others who share the same passions! If there is one luxury item you could acquire, what would it be? Another hard one!!! Seriously I don't know...luxury...what's that? Isn't it just luxurious enough to be with someone you love and smiling in the sunshine? That's luxury for me!!! But if I would have to chose...it would have to be.....a speed boat!!!! Thanks Kaye for those questions...you made me think!! Okay, so now...onto more answers. Fabric, floss or chart? Pick one. Fabric - can never have enough!! If you could ask God for a non superhero ability/talent, what would it be? If you could ask a designer a question, which designer and what would you ask? Theresa from Shakespeare's Peddlar--When are you going to release Sarah Philpott, Jane's sister?????? Besides stitching, what other hobby takes up the most of your time? Hardwood floors, tiles or carpet for your craft studio? NIGHT! although, lately it's been morning...must be because I was getting up everyday at 6 am!!! If you could only shop in one needlework store be it ONS or LNS for the rest of your life, which one would it be? How long/short is your hair? Do you keep it that lengh because you or someone else likes it? Long because I can do more things with it AND I find spending money on cutting hair is a waste!!! Next up is Evalina's questions. Hope you aren't getting sleepy reading my answers!!! What projects do you like to stitch - big or small? Both! I like to alternate between big and small!! What is your favorite fabric? 36 count Linen!!! What time of the day do you do most of the stitching? Night time although I never have enough light! Does your significant other supports your stitching hobby? He has no choice!!!!! What is your favorite drink after five? Tea! Do you have any live plants in your home? I do! My favourite is my China Doll tree that I grew from a wee sprout! What do you like to read? (Adventure, romance, mystery, non-fiction etc.) Books or magazines? Historical fiction and classics!! Meari tagged me so here are her questions answered!! 1. Do you have a SABLE (stash acquisition beyond life expectancy) situation? Not yet!! 2. What is the most favorite vacation you’ve been on? Cycling through the Sunshine Coast to camp at Porpoise Bay!! 4. Cat or Dog? BOTH!! But I should say cat because Titus is here and I don't want to hurt his feelings! 5. Have you taught anyone how to stitch? My sister! 6. What is/are your favorite TV show(s)? Game of Thrones, The Borgias and 24--I love Keifer Sutherland!! 7. What is your favorite stitching tool? My Q snaps!! 9. Are you adventurous when it comes to trying new foods? INDEED!!! Love trying new foods! Just not bugs or eyeballs or tongues or hearts or brains or feet!!!! Or other weird parts of the animal body that I don't believe should be eaten!! 10. Do you like kits or do you like kitting up your own? I kit up my own, that way I have leftovers for other stuff!! 11. If you could do anything for a day, what would it be? Go to the new Radiohead concert! Do you have a sweet tooth? Nope, a salty tooth! BRING ON THE FRIES AND CHIPS!!!! 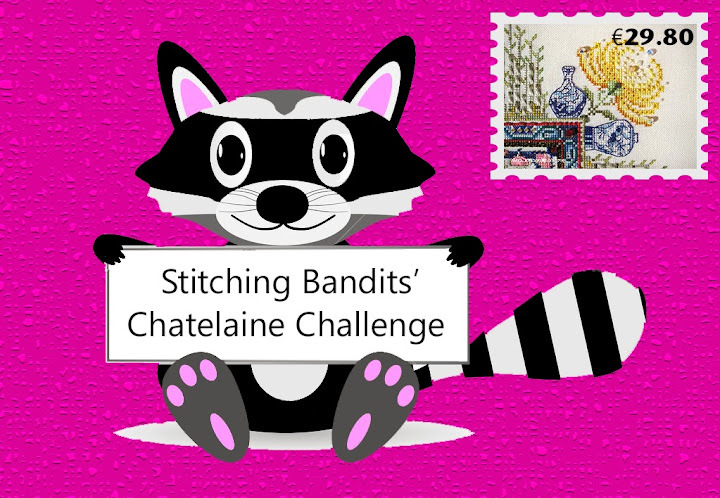 Do you stitch for charity? No I haven't....I stitch for lots of people though! Aida, Linen, or Evenweave? LINEN!!! Do you like to cook? Sometimes if I'm inspired and want to try something new! How long have you been blogging? Almost two years! Have you ever soiled the cloth you're stitching on? Twice: 1st piece was Tanglewood and my beloved cat, Lucy, who has passed on, threw up on it and the threads bled into the fabric. I stitched a butterfly over it and we like to think of the butterfly as our darling Lucy. My Tea Bath Fairy got soiled in my qsnaps because I didn't have any fabric covering where my hands held it so it's a bit soiled. I will wash it when it's finished! Thank you all for tagging me!! Rules are to answer the 11 questions, make up your own 11 questions and pass it on to 11 other people! 2. Do you like to stitch seasonal pieces? 3. Favourite kind of music or musician? 4. Favourite folktale or fairytale? 5. How many languages do you speak and what are they? 6. Who would you rather have: Aragorn or Legolas? 8. A favourite saying and why? 9. Your most prized possession? 10. Who you look up to and why? Lianne from 1897 School House and a new blogger! Have fun and enjoy your day! I'll be back with photos of my most recent cycling mini-trip adventure, stitching and some new projects I've started!! So interesting Anne! I read through it all. :) A speed boat!! Wow! Hi Anne, I really enjoyed your answers they made me think! Looks like you are having fun!! What fun! I loved reading all your answers! I have to do more research on Tsar Nicholas II. I loved that question best, I think. It was so interesting to see your answer to it. Hi Anne, great answers and questions! I loved learning so much more about you and yes, I did read to the end! It ws so fun reading all of your answers and learning more about you! Hope one day you get your speed boat! I enjoyed too much :)) Nice to read about yourself a bit more!!! Wow, now I feel I know you even more. Thank you for the answers, I really enjoyed reading them. Nicholas II was a lovely man married to a lovely Alexandra from Germany. I think she was a gran-daughter of Queen Victoria. But, for God's sake, STALIN?!?! Are you sure? He was intelligent, he'd done some good things (so did Hitler) but, to the best of my knowledge, he was a tyrant and a mass murderer responsible for close to 60 million deaths. He also is responsible for massacre in Katyn (http://en.wikipedia.org/wiki/Katyn_massacre). My heart is aching each time I think about it. Oh, and I forgot to add: I love your attitude towards hair cuts, from now on I'm growing my hair too! Ooooh I love your answers and your questions! My Internet here is back and forth but I should be doing a post on Tuesday, all things permitted, and I'll answer your questions then. It was so nice to learn more about you and your stitching. Thanks you for the tag. I will try and get to the answers sometime later this week. I have been working some extra and the heat that we are having is exhausting. Whoa! That was alotta tags, LOL It was great reading all the tidbits about you, though. -Ireland, I've been there 4 years ago and I can't wait to have the chance to go back one day. 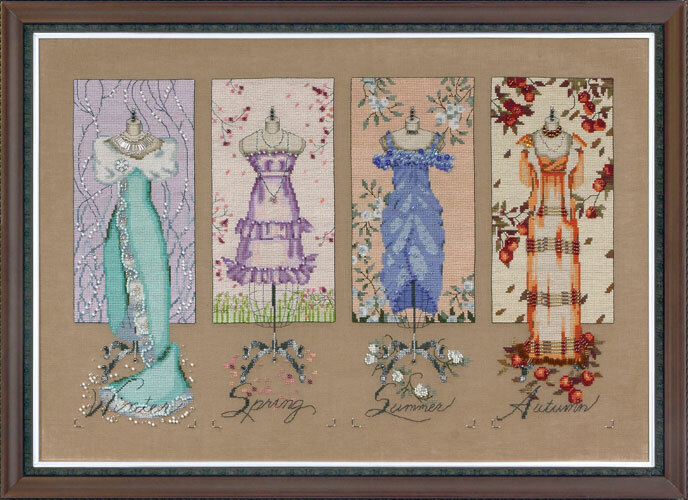 -Chatelaine is one of my favourite designer even though I haven't stitched any of her charts so far. -I keep my hair long for the same reasons as you do, even though I look better with my hair short, I have been thinking of cutting them lately, but after 12 years of at least shoulder long hair I really can't bring myself at cutting them shorter! -I love Chatelaine Herbularius too! -Not only my significant other has no choice but supporting my stitching hobby but my mum and dad too! -I've enjoyed the Game of Thrones TV show, but I think the books are better, I'm reading the second one at the moment. -I have the salty tooth! -My birthday is in January. Nice we have so much in common, plus the love for cats!